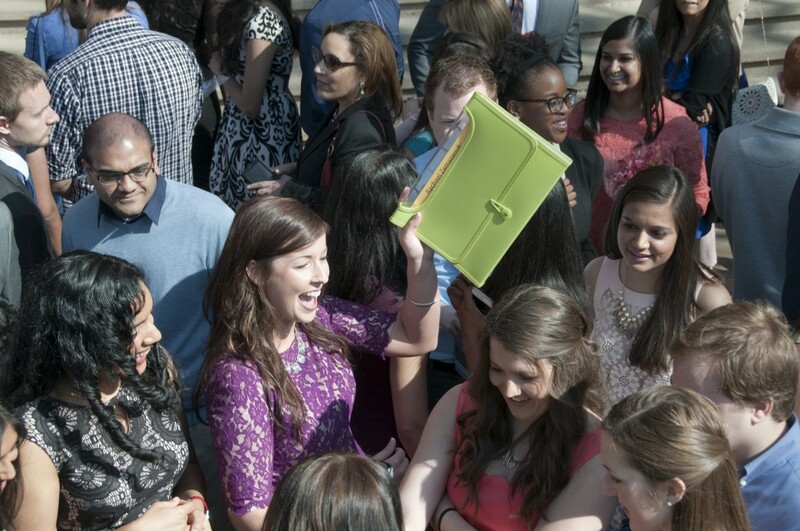 Jasleen Ghuman was all smiles as she shared her Match Day letter with friends on Friday. Jasleen Ghuman opened the white envelope in her hands, took a quick peek at the single page message inside, and exploded with screams of joy. Ten years ago, Ghuman came to the United States from India with her mother and siblings. Her dream was to become a doctor. Her dream took a big step toward becoming reality on Match Day, Friday, March 17. That’s when she learned that she will be headed to Northwestern University in Chicago this summer to begin a residency in internal medicine after graduating from the UMKC School of Medicine in May. Nearly 100 students in the School of Medicine’s Class of 2017 participated in this year’s National Residency Matching Program. Before receiving their Match letters from the Education Team Coordinators, they received an encouraging buildup from School of Medicine Dean Steven Kanter, M.D. Nearly 40 percent of this year’s class matched to a primary care specialty. Internal medicine had the largest number of UMKC student matches with 21, followed by pediatrics with 10, and family medicine with six. Twenty-three students will remain in Missouri for their residencies, 13 of them in the Kansas City area, including nine who matched to UMKC residencies and three who will stay in Kansas City for pediatrics at Children’s Mercy Hospital. For Bilal Alam, the news was still sinking nearly 15 minutes after opening his envelope. At Rhode Island Hospital in Providence, Rhode Island, Brown University had just one residency position available for an interventional radiologist. The letter told Alam that position was his. 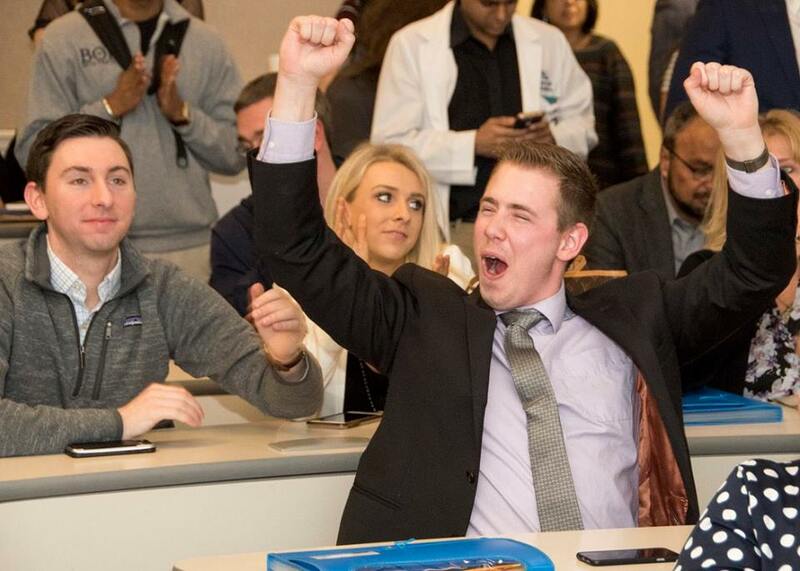 Medical students at schools across the country were sharing in the excitement at the same moment. The NRMP embargoes the public release of its list of where students have matched until 11 a.m. Central time each year. For students like Ghuman, it is a time of dreams coming true. Living in India, the family finances weren’t available for her to attend medical school. She earned a nursing degree instead. When the family moved to the United States, she began to support herself working at a nursing home. She later worked as a certified nursing assistant at the University of Washington Medical Center in Seattle before taking a chance and coming to Kansas City to attend medical school. As a crowd around her celebrated, a friend held up Ghuman’s cell phone. Her mother was on the other end, watching by Skype back home in Seattle. Half a country apart, the two celebrated together for a few moments. The Class of 2016 celebrates Match Day. Tears were still streaming down Emily McGhee’s face Friday morning long after she had opened her letter from the National Residency Matching Program. This was the day she and her classmates had worked toward and now reality was setting in. McGhee will be headed to Columbia, Missouri, this summer to begin her residency training in physical medicine and rehabilitation at the University of Missouri-Columbia Affiliated Hospitals. Not even the cold weather and threat of rain that forced the day’s festivities inside could dampen the spirit of Match Day at the UMKC School of Medicine. Shouts of joy rang out from each of the school’s three theaters as 91 students began opening their match letters at 11 a.m. 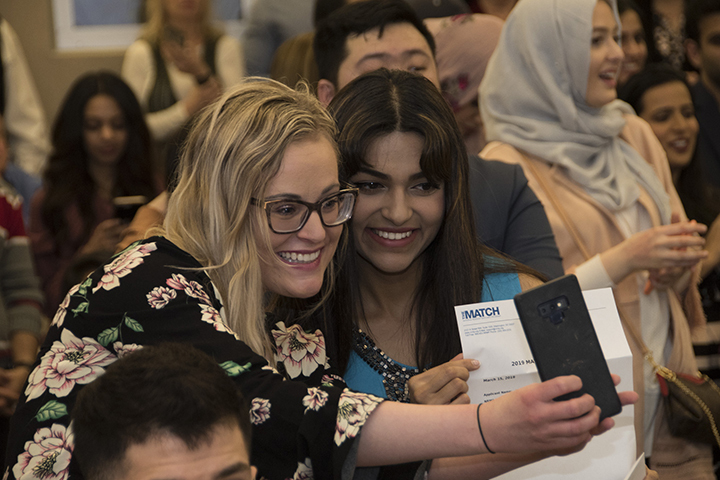 The National Residency Matching Program reported nearly 35,000 medical students at schools across the country were part of Match Day events synchronized to take place all at the same time. Nearly a fourth of this year’s School of Medicine class will be staying in the Kansas City metropolitan area to do their residencies, including 13 at UMKC School of Medicine programs and four in the pediatrics program at Children’s Mercy Kansas City. Just more than half of the class matched with programs in internal medicine, pediatrics, medicine-pediatrics, family medicine or obstetrics/gynecology – specialties that fall into the category of primary care. Internal medicine matches led the list with 22, followed by pediatrics with 17. This year’s class also learned it will scatter throughout the country to begin residencies at hospitals from New York to Florida to California, and one even in Hawaii. Parmpreet Kaur is one of those headed to the Big Apple, where she will begin training in child neurology at the Montefiore Medical Center-Albert Einstein College of Medicine in the Bronx. To make the day even more special, Kaur was celebrating with her parents who had driven from their home in Rochester, Minnesota. For Blake Montgomery, if the day seemed like a long time coming, it was for good reason. Montgomery took a full year off between his fourth and fifth years of the medical school program to be part of a research program at the National Institutes of Health in Bethesda, Maryland. Last year, Montgomery stood in the School of Medicine courtyard and celebrated as his future wife, Caitlin Montgomery, matched to a pediatrics residency at Children’s Mercy. This time, it was her turn to watch as Montgomery opened his letter telling him that he had matched with the orthopaedic surgery residency program at Stanford University in California. 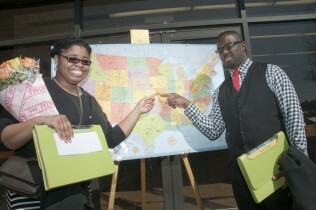 UMKC medical students received folders with information about where they would train as residents. Asha Nookala opened the envelope and read the words she wanted to see. “I got in Mayo!” the UMKC medical student exclaimed before embracing friends and family members. The envelope informed Nookala that she will spend four years training to be an anesthesiologist at the Mayo Clinic in Rochester, Minnesota. In addition to being one of the top hospitals in the world, the Mayo Clinic is close to home for Nookala, who is from Minneapolis. 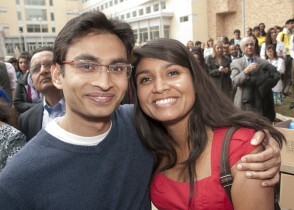 Nookala, her School of Medicine classmates and thousands of medical students across the United States observed a milestone on Friday, March 20. Match Day, as it’s known, marks the culmination of years of hard work and the promise of a new beginning. On the same day, at the same hour, graduating medical students are presented envelopes notifying them where they will train as residents. Students share the dramatic moment with loved ones. Balloons, flowers and one well-behaved pit bull were spread among the crowd that gathered in the courtyard in front of the School of Medicine. Technology shortened the distance that stood between some students and their families. Minutes after learning she was accepted into the physical medicine and rehabilitation residency program at East Carolina University, Ajaya Moturu used her phone to have a video chat with her mother, who lives in Maryland, and her sister, who lives in Florida. Moturu was eager to share the good news. “I grew up on the East Coast, and I wanted to go home,” she said. A nonprofit organization, the National Resident Matching Program, determines the matches. A mathematical algorithm sorts the preferences the applicants and the residency programs submit after students have completed interviews at locations where they think they would like to train. Recognizing that students often find a life partner during medical school, the National Resident Matching Program allows couples to pair their preferences. Gretchen Woodfork and Ryan Stokes will train in family medicine at UMKC. Stokes and Woodfork, who met at UMKC and were married last summer, went through the couples match. They will train at UMKC’s family medicine residency program, which is based at Truman Medical Center-Lakewood. Stokes said he was impressed by what he heard when he interviewed with the leaders of the family medicine residency program. “Even the weaknesses that they said they had, they were saying how they were actively trying to improve them,” he said. Some students knew their results before Match Day. Ophthalmology and urology matches are announced in January. Two UMKC students were accepted into ophthalmology residency programs, and one matched in urology. There is a separate match for prospective military physicians, as well. Four UMKC students learned in December that the Air Force had accepted their applications. Three were matched with programs at military hospitals. The fourth, Sadie Alongi, will train in orthopaedic surgery at UMKC. Many Air Force physician officers train at civilian academic medical centers. Alongi was offered the opportunity to pursue this route, which required her to apply to programs through the National Resident Matching Program. Applicants to the main match learn on the Monday before Match Day whether (but not where) they placed. Alongi was thrilled to find out she would be able to pursue her dream of becoming an orthopaedic surgeon. “I could not be more thankful for this great opportunity ahead of me,” she said. Alongi is one of 21 UMKC students who matched with a residency program at the UMKC School of Medicine or Children’s Mercy. Half of the students will enter a primary care residency (internal medicine, pediatrics, family medicine and medicine/pediatrics). Bailey Hunkler will train in internal medicine at Emory University School of Medicine in Atlanta. After two days of chill and rain, the ceremony took place under sunny skies and on the first day of spring. “Somehow on Match Day, things clear up,” Felix Okah, M.D., assistant dean for career advising, said from the podium, before the envelopes were distributed. Okah spoke after Dean Steven L. Kanter, who said the students were headed for success based on the paths taken by previous graduating classes. 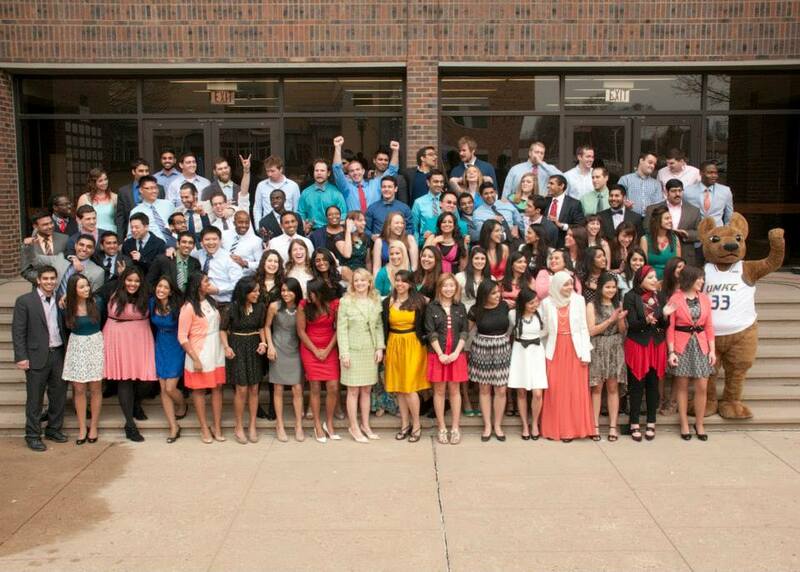 The School of Medicine Class of 2014 celebrates Match Day on March 21. 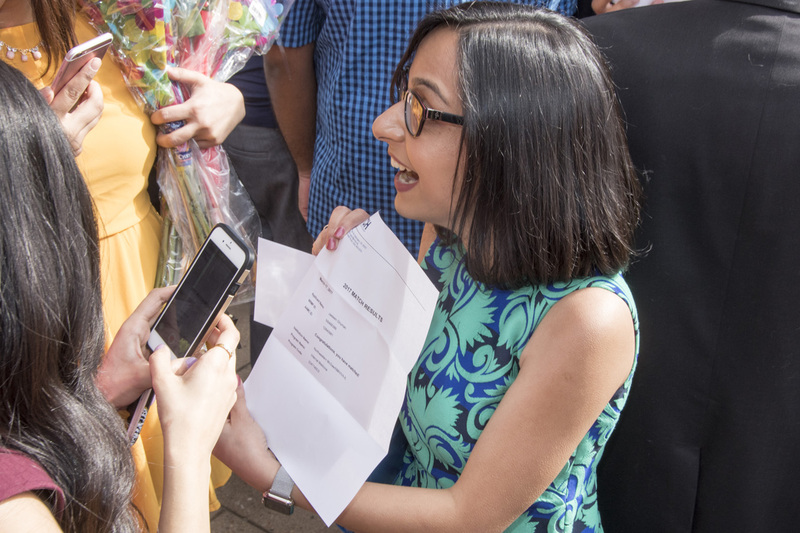 Rima Chakraborty, MS 6, (right) celebrates Match Day on March 21 with her husband, Neer Dutta, after she learned she will go to the University of Minnesota Medical School in Minneapolis, Minn., for her internal medicine residency. “University of Minnesota Medical School, Minneapolis, Minn.
Chakraborty then turned and embraced her husband, Neer Dutta, a student at Kansas City University of Medicine and Biosciences. “We both have family in Minnesota,” Chakraborty said as Dutta stood next to her with a bouquet of flowers. The two have been married for almost a year. Dutta said he would be working hard to land a residency position near Minneapolis when it’s his turn to go through the match process two years from now. Throughout the courtyard in front of the University of Missouri-Kansas City School of Medicine, 83 members of the Class of 2014 shared the joys and excitement of Match Day with friends and family. Just less than one-third of this year’s class will be staying in state for their residency training. 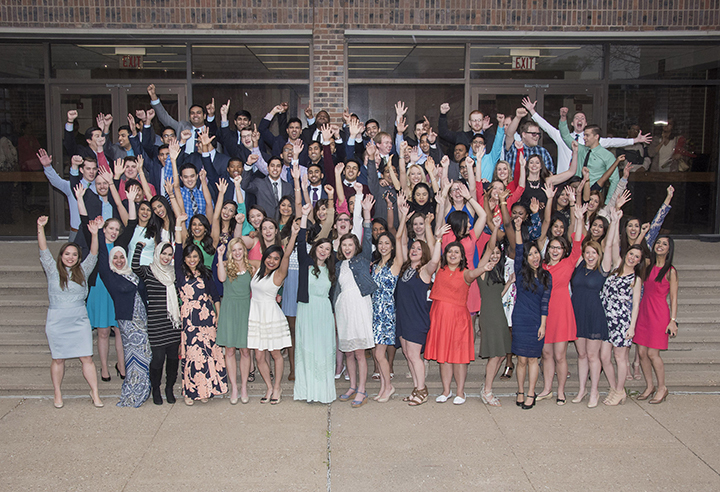 Of the 27 students who matched to a residency in Missouri, 16 will be going into UMKC residency programs, including three in the pediatrics residency at Children’s Mercy Kansas City. Internal medicine programs landed the largest number of UMKC students, with 22 headed to programs across the country — from Florida to Texas to California. Pediatrics and medicine-pediatrics had the next highest number of matches with 11. Overall, 36 students from the UMKC School of Medicine matched in a primary care field. School of Medicine Dean Betty Drees, M.D., F.A.C.P., congratulated the class on a successful Match Day and shared how alumni continue to tell her how well students from School perform in their residencies. Vikram Chakravarthy, MS 6, said Match Day is a time that students have long anticipated and called it a culmination of many years of hard work. Chakravarthy and Aakash Shah, MS 6, thanked Felix Oka, M.D., assistant dean for career advising, and Connie Beachler, career counselor, for their support and help throughout the match process on behalf of the class.